Have to have a cycled, filtered, heated system of size. Thank you for reading my email. I recently bought an Albino African Claw Frogglet. Im not sure of the age. When I first brought him home he was fine. I set up the tank after doing research on this little creature because the pet store that sold him to me didnt know much about their species. yet but change the water ever couple of days so its not too messy in the tank. The pet store said that they just put fish pellets for the fish in the tank and guessed that the frogs ate them too, I have bought freeze dried Hikari Tubifex Worms or him to eat. Sadly, now that Ive had him for a couple of weeks Im noticing very strange behaviors and I cant seem to find any diseases that match his criteria. When I first brought him home I used hard water because I didnt find any articles saying I couldnt. He was fine at first but after a couple of days he started swimming oddly, swimming up to the top and then floating down over and over and when Id turn on the light or walk towards him hed start thrashing his legs. Doing more research I found out hard metals are toxic so I bought Aqua Safe Plus by Tetra which is a water conditioner and dechlorinator all in one. 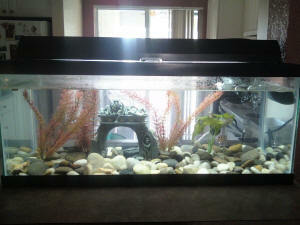 I changed all of the water and added the conditioner in to fresh water. So to keep you updated on the time frame he was in the hard unconditioned water for about a week then I changed the water with the conditioner. I still used the hard water but I thought the conditioner would help, but he wasnt getting any better, in fact he was getting worse, he was now trashing at random times and spinning so that his belly would be facing up and then hed flip over for about a minute over and over. Then he would stop and just float around my guess was that he was exhausted from thrashing. Today I decided to get regular city tap water for him and added the conditioner/dechlorinator to the water hoping he would be able start controlling his legs. When he first started thrashing I thought he was just nervous around people but now I fear there is something more going on. It seems almost like he is epileptic and it gets set off by people walking towards him. I havent moved him to a shallow tank because I often look over and he is floating at the top where he can breathe. The closes symptoms I have been able to notice are cramping leg or slightly paralyzed leg syndrome but I wanted to check in with the experts before I tried any remedies. Any advice you can give would be very helpful. Sorry for the length, I wanted to give you as much detail of the situation as possible. Thank you for your time. and have gravel on the bottom and no plants or any other frogs or fish with him. I have fed him freeze dried shrimp since day one. I have tried to give him freeze dried blood worms and krill and he doesn't want to eat anything but the shrimp. My problem is I found him upside down in his tank last night. I was able to net him without any effort at all. I cleaned his tank( I keep gallon water jugs that have had Stress Zyme put into them and set them aside for the next tank cleaning) and put him in a shallow container to keep a better eye on him because he was not able to swim to the surface to get air. He is not eating at all and he is still very un active. He seems to not be able to use his back legs and when I moved his small container he almost rolled up in a ball and was acting like he was having a seizure. He flipped over to his back again and couldn't roll back to his normal side. His one back leg went out strait as a board and stayed that way. (I just checked him and his leg is back to normal). He is not eating anything at all now and I still haven't introduced him back into the bigger tank for fear he will not be able to make it to the top to get air. When he surfaces in the small container his breathing is very hard and seems to be taking extremely big breaths. He also feels cold to the touch. He does not have any shedding skin issues or bloating or red leg. and not sure exactly where and what to get. What could possibly be the problem and what can I do to help him? I have been reading illnesses and diseases and found little information on my particular issue. Could you please help Kermit ( the frog). Thank you! Update: Within the last 5 minutes of writing this I checked on Kermit before sending this and he now has a long milky slime extending from his rear feet to under his chin. A quick response would greatly be appreciated. My 8 year old daughter is very upset thinking her pet frog is dying. Thanks again. Hi, I so very much hope that you can help me. 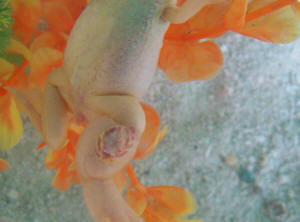 I have an Albino African Clawed Frog, approximately 4 1/2-5years old. I bought him as a dwarf but I am not entirely sure that he is a dwarf. I had him in a bowl when he was still tiny, and then for a while after his last tank broke, and he did well in there, but I wanted him to have more suitable living conditions, so about three months ago I got him a new tank (not brand new-it was previously used). I rinsed it out and set it up, let it run for a while and tested the water by throwing a bunch of rosies in their to see how they'd do. None of them died, so eventually I went ahead and put my frog in. which he eventually did. Slowly. I noticed he stopped eating. He would eat very little if at all. He had originally been eating HBH Frog and Tadpole Pellets, but later stopped eating those so I fed him the ReptoMin pellets, shrimp, and krill. He stopped eating the pellets, but ate a lot of the shrimp, and has been eating mostly those for the last three months, but then stopped eating those so much as well. I know he can't see well, so typically, I have to help him find the food (move my finger or a plastic spoon around near the food) and he lunges and gets it then, but that hasn't been working lately. So. I got six more rosies to see if he'd go after them. Most of them died, but I think he ate maybe one or two. Maybe a day after the last one disappeared, I noticed him upside down at the bottom of the tank, and I freaked. I righted him, he was still alive, and I brought him to the surface for air. He didn't really struggle, just kind of floated around then let the filter blow him back down and around, so I scooped him back up again and let him cling to his feeding ring for support (he does that a lot anyway). Every so often, he'd let go and drift around, but I didn't see him upside down again until hours later. I tested the water and from what I could tell, everything was safe, except the water may have been a little hard (that one didn't really match up well to anything) but the nitrite was bad, I followed the instructions to do a water change, and I removed the gravel so that he can eat sinking pellets from the bottom. I posted a question on yahoo answers for more help, researched as much as possible on Google, and just tried to keep an eye on him in the mean time. Yahoo answers has given me only one response: flush him. Thanks. I woke up periodically throughout the night and found him a few times upside down on the bottom again, at which point I realized that, where he might squiggle his front legs around, he didn't kick me with his back legs. I touched them and moved them and they were limp/paralyzed. I read a little about this (that got more results than anything but not a lot by any means). It could be from nitrite, vitamin or nutrient deficiency, or Trematodes/flukes. It listed a few things I can try, crushing up vitamins and mixing baths and such, but I had a few questions about the details and they don't offer any contact info. I don't know how to tell which one it is, and I am afraid to do too much/over medicate. Today I bought him frozen bloodworms and more frog and tadpole pellets. He has three options of things to eat, but will not eat anything, and is shedding his skin now (I think he did that a few days before dropping as well). Once in a while he opens his mouth very wide and kind of twists. He seems frustrated about his skin. I put him in a mini carrier so that he can surface to breathe (I don't know how long he can hold his breath for but I work two jobs the next few days and won't be able to watch him closely, and I don't want him to drown in my absence). Please please please, if you have any information on this, help me! Whatever is wrong with him, I must have done, and I am desperate to help him. Thank you for your time-I hope this won't too much. If you can, please write me back as soon as possible. Brooke P.S. If you post this, please don't post my e-mail/last name. I don't understand-you said to keep reading, and I am reading and reading but cannot find anything similar to my frogs situation (I did click the link you sent me). but I have to remove my frog when I am leaving because it cannot swim to the top for air anymore. He gets to the bottom of the water and can't get back up. but wanted to make sure it wouldn't be over doing it either. I need some solid instruction here and the people at the pet stores don't seem to really know what they are talking about. I realize rosies were a poor choice now, but now I need to know how to fix it. It is just really frustrating and scary. Please guide me. That is where I read about Trematodes, etc. My frog can't move his back legs. I don't know what else to do except to try something that website suggests, or else he'll drown. That is the only place I have found advice, except for the careless advice on Yahoo Answers that suggested I flush him. I have had fish and frog tanks for years and this is the first time I have experienced something like this. He's been shedding this whole time. I don't know what other information to give you and I don't know what to be looking for. If it weren't for his being upside down and his constant shedding, he would appear normal, but after finding him upside down I discovered the cause was that his back legs can't move anymore. Earlier in the day, he was still swimming fine. 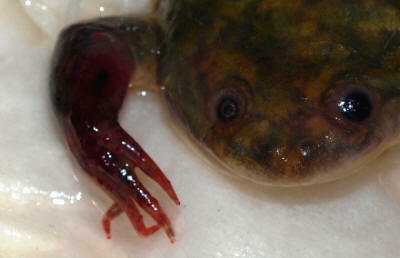 I have a African clawed frog who is now 2 1/2 years old. Just recently I purchased a few feeder fish, within the first day of their purchase one of the fish had died, and short coming so did the rest. However before the fish passed they were slowly getting this white fuzzy crap growing on there scales. Now I am afraid that my frog has it. He's got white fuzzy's on his arm and on the black sticky part of his arms it is red and looks like sores. How do I treat this? What should I do? pH 8, Nitrate 0 The frogs are active, eating well, and look healthy. The 3 remaining Tiger Barbs are showing some signs of distress. You can see they are gasping a bit. As for the Green Corys, they look fine. My tank looks extremely clean from the decreased feedings and daily water changes. Thanks again Neale. Well you are correct. I tested the tap water before and after adding my chlorine/chloramine conditioner and received 1.0 ammonia readings. So any recommendations on the product to buy? I'm sure the product you advise will take care of ammonia as well as chlorine in my tap, so maybe I should just stop using this generic conditioner altogether. Kind of hard cycling out ammonia when every water change, I'm adding more. My son has a ACF that seems to be taking a turn. It has been healthy and fine, to this point, but I did notice it was turning a darker green color in blotches, rather than staying it's pretty light green color. It lives with two other fish and a snail, and we change out the water by 2/3 weekly. We have floating plants for the bowl. The frog is swimming in a twisting motion, and then stops and just floats. Sometimes it seems to stay slight twisted almost upside down. This appears to be different behavior than we have seen to this point (one month). I have removed it from the big tank and put it alone with a bit of shrimp in water that has been dechlorinated to see ---I am not sure to see what! Is it dying or is there something I can do for it to try to save it? <I look at it this way: A sales clerk wouldn't stop himself selling me a ghastly pair of yellow trousers with pink polka dots. I have a new Albino ACF that I got about two weeks ago. He was perfect looking when I bought him at our local Wal-Mart, but now he has tiny little black dots covering his back from his head to his toes. an Apple Snail, and two Orange burst Glofish. They all share the same tank. I did not like the gravel in the tank so I opted to put seashells in it instead (I hope this will not harm them and I cleaned the shells well before I put them in). <Seashells are a bad idea. Two issues. Firstly, they harden the water. I constantly keep a check on the water and the Nitrates are at 40 mg/L, Nitrites are at 0 mg/L, the water is very hard at 300 ppm, Alkalinity is at 180 ppm, and pH is at 7.2. I have now managed to get the Nitrates to the fringe of being okay for the fish, but I have trouble keeping it down. I use Tetra Easy Balance with Nitraban, which says is supposed to help maintain the tank with less frequent water changes. I do not get a lot of time to do water changes so this works well for me. The water is crystal clear, I use Tetra Whisper filters with Carbon, I keep a heater, which I have just lowered to a temperature of about 80 degrees F since I was treating the tank for Ick and it was at about 85 degrees F.
The treatment was performed a few weeks before I added the ACF. I love animals and I am very interested in keeping a colorful and diverse tank. demanding and expensive. That's why I don't keep all the animals I'd like! ended up with a very bad looking abrasion just under his eye and a big hole in his tail fin before he died. I can't seem to keep the Pleco very well since he was my second one. black speckles or dots all over his back and is it normal for me to see the red veins or whatever they may be? 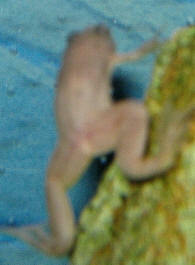 I have attached a picture of the frog. including the picture as an attachment is the only thing I can do with this email. Am I being paranoid? I did hours of research last night to no avail. I even tried the suggested Google search engine on top of the others I had checked and Google sent me right back to your page. I laughed hilariously at that and decided to give up on my search and finally send you an email. I had to get some sleep first though as I had ended up staying awake until 4:30 this morning researching this issue. Please help me, I would hate for my new frog to die. <I would hate that too. As another animal lover, I'm really keen you enjoy your pets and that you pets are healthy living with you. In this case, I think the frog is not so much ill yet as reacting to environmental stress. I am beginning to get attached. Thank you much for your advice Neale. I did not research the fish at first since it was a start to a hobby I thought my husband and I could enjoy. I started out with a 20 gallon tank that was given to me, with just Black Tetras, Red Tetras, and the Algae Eater I referred to at first, however that tank is now sitting empty in our back yard due to my lack of knowledge at the time in cleaning it and it got a crack across the glass from one side to the other. I have since learned not to do a full water change and more importantly not to use such hot water. A mistake that I will most definitely avoid again in the future. After that, we went to the nearest store and bought the biggest tank they had that we could afford at the time, which was the 10 gallon tank. This was mainly to get the fish back to a tank quickly. I then started to research the proper care and maintenance of fish and the different types that you could have together. Please understand, the town I live in is rather small compared to most, so we don't have much to work with. I am not a small town kind of person and moved around a lot as I got older. Being only 25 now, I understand the importance of having the resources you need and that it is harder to obtain in a small city. This being said, the information I obtained from Wal-Mart may not have been sufficient enough to have the kind of fish and aquarium I wanted. I have had the aquarium for about 4 months now and it was stabilized for about two weeks before I added the frog. Needless to say, I was not happy with the Tetras and gave them to a friend so that I could have more tropical fish that were 'prettier'. I started out with just the Mollies and the snail. I added the Mollies before I got rid of the Tetras and some of them died, I think from bullying from the Red Tetra, which led to the purchase of more mollies so that I finally ended up with the amount that I mentioned in the original email. So, by this time, I had done some research on what type of fish were compatible with Mollies. Everything that I found suggested that other community fish were okay and my husband wanted Glofish so I got the two mentioned previously. I was aware of the fact that they do better in groups of 6 or more but they are not cheap, to us people in the small town. So, two it is until I can afford more, and I have kept an eye on them and they seem fairly happy. They are very active as all the material I have read suggested they would be. 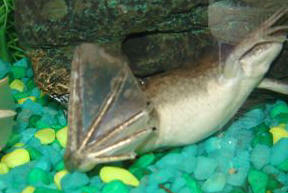 The Algae Eater is the only large fish in the tank and keeps mostly to itself. My research showed that the Mollies and the Glofish were both peaceful fish and were compatible. I have had them together and living, what I find to be very well, together for about a month now. As I mentioned before I have just added the frog, mainly because I saw it at the store and they seemed interesting. I did a little bit of research before I bought it, but I suppose not enough. I promise you, I am normally a very thorough person, so once I had them all together I made sure to get all of the information I could gather in order to maintain a healthy and peaceful aquarium. So far all is well with the exception of the appearance of the spots on the ACF. I did research the pictures on many sites and I am positive it is an Albino African Clawed Frog, though I wonder if it may be pigmented, but the pictures I have viewed don't seem to match the black spots he has. My main concern was whether it was normal for the frog to do this or if I needed to change something quickly. Basically, should I be alarmed or just keep an eye him? From what I gather you are saying that I should maintain the water and keep the diet varied, with mostly soft or live foods. I was able to dig up some worms today and cut them into small enough pieces for him to swallow. He definitely loved them. I will continue to try to give a variety of food to him, bearing in mind that the live food provides more nutrients and prevents constipation. I am aware that they need a lower water temperature, so I have started lowering the temperature slowly as to not shock any of the fish with a sudden change. What do you suggest that I do about keeping Nitrates down? All of my other tests show to be good according to the chart that I have to compare the tests to. I may be a novice hobbyist, but I do hope to get better. All things get better with time and some trial and error, otherwise we would not have the technology we have today. I did find your information helpful, but for some reason I picture you to be a Simon Cal. Not intending to offend you, as I find it rather comical. I believe you are a very intelligent person, but feel that you may underestimate the intelligence of those that refer to your site for assistance and guidance. Keep doing what you do. You are great, as I am sure you are aware of. I hope to be able to get a bigger tank soon. In the meantime, I try with what I have and maybe it will be okay, though I completely understand the affect the small aquarium may have on the fish. Please forgive me if my email seems a little scattered, my mind thinks differently than most and I end up confusing myself and others rather easily. I find it amazing that I can be an intelligent person but yet so simple minded at times, well a lot. I hope it is a refreshing difference from your normal inquiries. Thank you for your help. 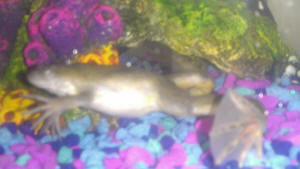 My son brought home a baby Clawed African Water Frog from school in May. Yesterday, I noticed him belly-up in the bottom on his tank. I noticed he jerked his back leg every now and then so I put him in a shallow container with water so he could more easily reach the surface for air. I checked on him throughout the day yesterday and found that he would go to the top for air but other than that did not move. Last night I put him back in the larger tank and once again, we found him belly-up, but still alive, at the bottom of the tank this morning. I have read information on your site and he doesn't have a bloated stomach, there are no white patches on his body and he has no bloody red areas. He just doesn't move much. Other than the past two days, he is kept by himself in a 5 gallon filtered tank. Any suggestions on what might be wrong with him and how I can help him would be greatly appreciated. 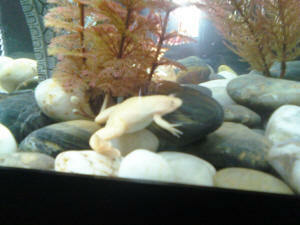 Hello, I emailed a question regarding my son's clawed African water frog earlier today. I just went to check on him and he seemed to "cough" up a cloudy substance. Thought that the new information might help figure out what is wrong with him. We are new pet owners, and have obviously done something seriously wrong in caring for our 6-month-old albino African black-clawed frog. we have been negligent in changing the water more than once a month. about three times a week (she has been a voracious eater, I might add). I do not know the ammonia or nitrate levels -- we do not have the tools to check those levels at this point (nor did we understand the importance of monitoring such things in caring for our first aquatic pet when we purchased her). About three weeks ago, I performed a 50 percent water change and had unknowingly used a water conditioner that was expired. Our frog lost her appetite about 10 days ago -- not eating many bloodworms at all. Then I noticed some small reddish/purplish spots on her left upper leg (above the knee). These continued to grow and at one point developed a white kind of fluff on top. At this point I sought help from the fish store where we had purchased her. The owner was convinced this was a bacterial infection stemming from a chemical burn and quite possibly poor water conditions. She gave us a treatment plan that included water changes every three days and Triple Sulfa (1/4 pack per dosage -- spread over five days). After following the treatment plan for a week, I've noticed only changes for the worse. My frog's entire leg is swollen to the point that she can no longer use it effectively. The red/purple spots expanded and then today opened to reveal a white and puffy-looking wound which is trailing a wispy white matter. This wispy white matter is all over the tank -- attached to the plants, etc. I've attached a picture (not the greatest quality). Thank you in advance for any information that you can give me. If we can't save this frog, maybe we can save a future pet. look at his foot it is cloudy or white???? there house mates are one balloon molly seems fine no white patches or anything and a sucker cleaner fish......he seems fine....algae cleaner?? ?